RIO DE JANEIRO: Ten-man Ecuador held France to a 0-0 draw at the Maracana on Wednesday but Didier Deschamps' side still topped Group E to progress to a last-16 tie against Nigeria. Through luck, determination, bad finishing and excellent goalkeeping by Alexander Dominguez, Ecuador resisted even after captain Antonio Valencia was ordered off early in the second half for a studs-up challenge on Lucas Digne. The result was disappointing for France coach Didier Deschamps but was enough to take first place with seven points and the easier of the possible second-round ties next Monday. "We came here to qualify and did it finishing top of our group," said Deschamps. "We didn't have a huge number of chances and their 'keeper made some good saves but it doesn't spoil our joy at being in the last 16." Switzerland's 3-0 win over Honduras in the group's other game gave them second place and a tough match against Argentina on Tuesday as Ecuador become the first South American side to be knocked out of this World Cup. And Ecuador coach Reinaldo Rueda was left to lament the sending-off of his captain as his team came up just short. "There is nothing to be done about it now but we lost an important player in our structure," said the Colombian. "Various refereeing decisions went against us and it was difficult to hold on for a draw but the players showed great character." Deschamps made six changes for this game and will certainly bring back several of the missing players to take on Nigeria. Karim Benzema, scorer of three goals in wins over Honduras and Switzerland, kept his place in the side, but France missed the creativity of Mathieu Valbuena and Yohan Cabaye, the latter absent due to suspension and replaced by Southampton's Morgan Schneiderlin. 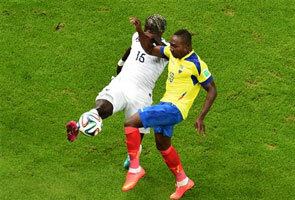 Les Bleus controlled much of the first half, but only sporadically troubled Dominguez in the Ecuador goal. The Ecuadorean 'keeper held a crisply-struck volley from Moussa Sissoko with 15 minutes played and did well to palm the ball over the bar when Paul Pogba got his head to an Antoine Griezmann free-kick. Ecuador began to threaten as the half wore on, almost breaking through when Enner Valencia rose above Digne to connect with Michael Arroyo's left-wing cross only for Hugo Lloris to intervene. Many of the Maracana crowd greeted the half-time whistle with jeers, but the match came to life within moments of the restart. A flowing French move saw Benzema and Paul Pogba combine to set up Bacary Sagna on the right, and his low cross to the near post was met by Griezmann. However, a combination of Dominguez and the woodwork denied the Real Sociedad man the opening goal. Rueda's side were then dealt a major blow when Valencia was sent off with the second period just four minutes old. The Ecuador captain lost control of the ball on the right flank and scraped his studs along Digne's left leg, leaving his opponent in apparent agony on the turf. Valencia received a straight red card from the Ivorian referee, but Digne was able to carry on as France sought to make the most of their extra man. Benzema set up Blaise Matuidi for a shot that was saved at the second attempt by Dominguez before the unmarked Pogba could only head wide from a Sissoko cross. Benzema and Pogba both came close to getting the breakthrough late on, while substitute Alex Ibarra tested Lloris at the other end after an excellent run forward down the right flank. In Manaus, Switzerland's Xherdan Shaqiri erased his side's lingering World Cup pain with all the goals in the 3-0 win over Honduras. In just the sixth minute Bayern Munich midfielder found the target with an unstoppable left-footed strike from just outside the area that flew past a helpless Noel Valladares and into the top corner. Just after the half-hour the Swiss doubled their lead following a swift counter-attack. Victor Bernardez made a mistake in midfield and Josip Drmic raced forward before playing in Shaqiri, who kept his composure with just the goalkeeper to beat, slotting the ball to his left. Switzerland killed the game 20 minutes from time. Drmic, enjoying his role on the left, beat Bernardez and again found Shaqiri, who was unerring in his finish.